The work of Stefan Zweig enjoyed a welcome renaissance in 2013 after years of neglect in Western art. A prolific artist, Zweig became something of a Dostoevsky figure for early twentieth century writing in Europe – not because of length, but because of acute psychological insight and harrowing themes of passion and obsession within the societal confines of pre- and post-war mores. Writing in the milieu of fin de siècle Vienna, it is small wonder that he was acquainted with Freud and Schnitzler, and it is not difficult to imagine that conversations of psychological repression and expression, mania, and suffering featured prominently. As a result, Zweig’s work was focussed on the psychological deconstruction of human emotion and fallibility and the universality of such feelings. Two of his works, Journey into the Past (Widerstand der Wirklichkeit) and Maria Stuart were adapted into A Promise and MARY Queen of Scots respectively, and although they may seem superficially dissimilar, their respective filmmakers take veritable cues from Zweig’s oeuvre in remaining true to the verisimilitude of his psychological acuity. – William S. Burroughs, Exterminator! To be continued….the ultimate cliffhanger. The cliffhanger technique may be one of the most overused plot devices in literature, yet when used cleverly, has been done so to great effect. The popularisation of the cliffhanger began with Victorian serials, including the works of Charles Dickens and Wilkie Collins. The authors’ works were initially published in serialised installments every month, and so the stories were imbued with a particular rhythm, punctuated by cliffhanger at the end of each installment so that the public was sufficiently tantalised into looking forward to the next one. This technique contains into modern entertainment, as television serials and end-of-season episodes often end with such a cliffhanger as to propel the audience into speculative agony until the next one begins. Overused, perhaps – but no less effective. This idea of compelling the reader through the power of literature into a web of intrigue is at the heart of Dans le maison, enticing not only the characters within the film, but doubly the audience, completing a metafictional arc of who is really manipulating whom. Where do we go when we do not have to be ourselves? In our daily lives, we are surrounded by the faces of others, our visage thusly reflecting those of an external nature. We slip in and out of masks like second skins, but who are we when we are alone? One has to wonder that, when there is no one watching, if we assume a visage at all. With gleeful abandon, Léos Carax takes this notion and runs with it, both figuratively and literally. 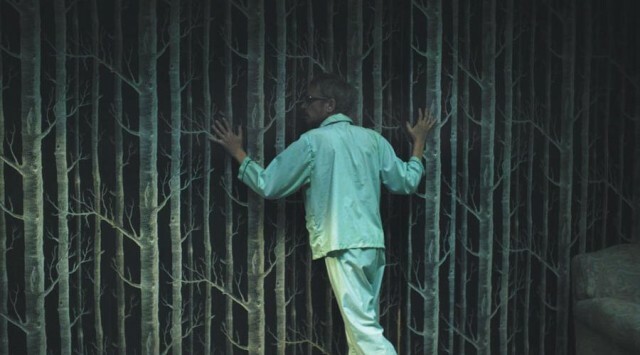 As a result, Holy Motors is an utterly engrossing, unpredictable, and unforgiving deconstruction of identity and its malleability, effectively blurring the line between fantasy and reality. Death is the only inevitability of our tenuous mortality. We attempt to prolong it by any means possible, a self-defeating exercise in futility. As we grow older, the need to reclaim our human dignity becomes of the utmost importance, and so becomes intertwined with our concept of death. How does one die with dignity? Can such a thing even be possible? Perhaps we die utterly alone, a prisoner within our self-constructed walls of skull and consciousness, waiting for the last breath and final reprieve. Perhaps cruelly, death can be the most ultimate form of intimacy, the final act of love. With stately and exacting precision, Michael Haneke allows us to witness this final chapter of a couple struggling with mortality and its consequences. It is a domestic tragedy, imbued not with bathos or theatrics, but with the emotional honesty and stark realism of facing mortality with quiet magnanimity. When one is young, summer lasts forever. It is a restless and carefree cat-like creature, stretching and coiling lazily in the tall grass, infused with a Dionysian love of youthful abandon. Mia Hansen-Løve places her latest film directly amidst the clear sky and drone of cicadas, conjuring a hazy atmosphere of summer love found and lost in a manner that is both sexually candid and sensitively insightful.